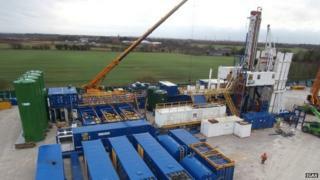 Gas has been found in shale rock at a test drilling site in Salford, an energy company has said. IGas said it had detected the gas in samples from its test well at Barton Moss. Drilling will now stop while the samples are analysed, which is likely to take six months, the company said. About 60 anti-fracking protesters in a camp near the site will have a hearing against their eviction at the Court of Appeal on 16 July. IGas chief executive Andrew Austin said: "These early exploration results are key to our understanding of the potential resource in the area." The company also said it now hopes to map a 100 sq km area of the north west to determine where else to drill for shale gas. About 60 protesters have been camped on Barton Moss Road since test drilling started in November last year. In March, lawyers for the group won a late legal bid to halt their eviction by landowners Peel Investments. A date for a Court of Appeal hearing to challenge the eviction has been set for 16 July, said Green Party candidate and defendant in the case Martin Burke. "This week's UN report on climate change further justifies the necessary and continuing protest at Barton Moss against fracking. "We need to face up to the challenge and move away from the mass use of fossil fuels, which will also dramatically improve our quality of life." Hydraulic fracturing or fracking involves pumping a mixture of water and chemicals into shale rock at high pressure to extract gas and oil. Environmental campaigners claim the process encourages reliance on fossil fuels instead of promoting investment in renewable energy sources. Proponents of the process say it unlocks huge deposits of oil and natural gas, increases a country's energy security and boosts the economies of the areas in which it takes place.